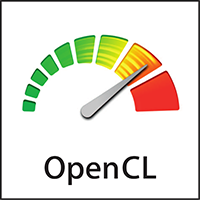 The following OpenCL benchmarks are currently available for public download. We do our best to keep this list updated whenever we hear of something new. If we have missed something or you see anything that needs updating, please let us know by Contacting Us. IWOCL attracts a wide range of OpenCL experts, from across industry, academia and suppliers and has become the premier venue to meet other developers using OpenCL to solve challenging problems, whether in embedded systems or in high performance computing. Join us in Boston May 13-15 for the 7th IWOCL. The SPEC ACCEL® benchmark suite tests performance with computationally intensive parallel applications running under the OpenCL, OpenACC, and OpenMP 4 target offloading APIs. The suite exercises the performance of the accelerator, host CPU, memory transfer between host and accelerator, support libraries and drivers, and compilers. The C Framework for OpenCL, cf4ocl, is a cross-platform pure C object-oriented framework for developing and benchmarking OpenCL projects. It aims to (1) Promote the rapid development of OpenCL host programs in C (with support for C++) and avoid the tedious and error-prone boilerplate code usually required (2) Assist in the benchmarking of OpenCL events, such as kernel execution and data transfers. Profiling comes for free with cf4ocl (3) Simplify the analysis of the OpenCL environment and of kernel requirements, and (4) Allow for all levels of integration with existing OpenCL code: use as much or as few of cf4ocl required for your project, with full access to the underlying OpenCL objects and functions at all times. Programming FPGAs with OpenCL is now becoming mainstream. However, unlike software, there are no benchmarks for evaluating these compilers. CHO is an attempt at providing some sort of “standard” benchmark suite. CompuBench, developed by Kishonti Ltd, measures the compute performance of your OpenCL and CUDA device. FinanceBench, developed at the University of Deleware, is aimed at those who work with financial code to see how certain code paths can be targeted for accelerators. We utilized the original QuantLib software framework and samples to port four existing applications for quantitative finance. BabelStream is a benchmark used to measure the memory transfer rates to/from capacity memory. Unlike other memory bandwidth benchmarks this does not include any PCIe transfer time for attached devices. This benchmark is similar in spirit, and based on, the STREAM benchmark for CPUs and supports OpenCL as well as many other APIs. Hetero-Mark is designed to model the workloads that are similar to real world applications, where the major part of the application is written in general purpose programming languages, while only a small, performance critical portion is written using GPU-accelerated libraries. The Geekbench Compute Benchmark, developed by Primate Labs, measures the performance of GPUs performing common compute tasks, e.g. image processing. This benchmark takes from 2 to 10 minutes to complete and supports OpenCL. The purpose of this benchmark tool is to evaluate performance bounds of GPUs on mixed operational intensity kernels. The executed kernel is customized on a range of different operational intensity values. Modern GPUs are able to hide memory latency by switching execution to threads able to perform compute operations. Using this tool one can assess the practical optimum balance in both types of operations for a GPU. CUDA, HIP and OpenCL implementations have been developed. The OpenDwarfs project provides a benchmark suite consisting of different computation/communication idioms, i.e., dwarfs, for state-of-art multicore CPUs, GPUs, Intel MICs and Altera FPGAs. A thorough description of the latest version, including in-depth performance evaluation for a larger number of OpenDwarfs, is described in “OpenDwarfs: Characterization of Dwarf-based Benchmarks on Fixed and Reconfigurable Architectures” by Krommydas, Feng, Antonopoulos, and Bellas in Journal of Signal Processing Systems (JSPS), Springer, October 2015. PolyBench is a collection of benchmarks containing static control parts. The purpose is to uniformize the execution and monitoring of kernels, typically used in past and current publications. The original PolyBench Suite has been modified to run on GPUs and accelerators by using different programming languages, including OpenCL. cl-mem is an OpenCL memory benchmark utility. Version 0.2 tests sequential write and read speeds. Version 0.3 added sequential copy.